Please check your e-mail adress. Your loved ones have something special to celebrate and you want them to know that you arethinking of them at this joyous occasion. Why not send them a unique GreetingCard from Bonnyprints? You can choose from a variety of GreetingCards and personalise as you wish. 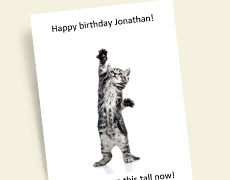 Say Happy Birthday with one of our many cheerfulBirthday Greeting Cards. Choose your favouritecard and customise it online. Add your personal message and tell them how muchthey mean to you. Are your friends getting married soon? Did they share the news of their newborn baby with you? 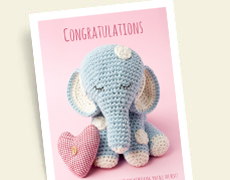 Show them you care by sending out customised congratulationscards with your personal message. Say cheers to the happy couplein an elegant Wedding Greeting Cardor welcome anewborn baby with one of our cute Baby Greeting Cards.Say it all in your own words. Your friends will be delighted and will cherishyour message. Greeting Cards are a lovely way to celebratea happy event.